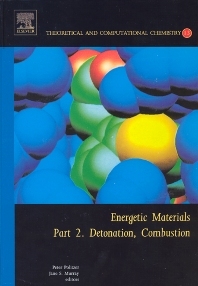 This volume provides an overview of current research and recent advances in the area of energetic materials, focusing on explosives and propellants. The contents and format reflect the fact that theory, experiment and computation are closely linked in this field. The challenge of developing energetic materials that are less sensitive to accidental stimuli continues to be of critical importance. This volume opens with discussions of some determinants of sensitivity and its correlations with various molecular and crystal properties. The next several chapters deal in considerable detail with different aspects and mechanisms of the initiation of detonation, and its quantitative description. The second half of this volume focuses upon combustion. Extensive studies model ignition and combustion, with applications to different propellants. The final chapter is an exhaustive computational treatment of the mechanism and kinetics of combustion initiation reactions of ammonium perchlorate. Overall, this volume illustrates the progress that has been made in the field of energetic materials and some of the areas of current activity. It also indicates the challenges involved in characterizing and understanding the properties and behaviour of these compounds. The work is a unique state-of-the-art treatment of the subject, written by pre-eminent researchers in the field. Computational chemists, Chemical Physicists, Chemical Engineers, Materials Chemists.